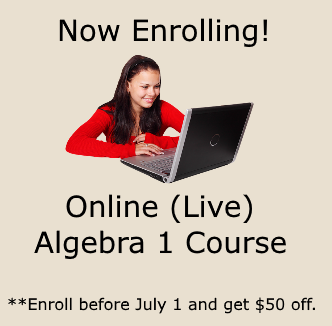 Are you ready to dive into our solving inequalities unit? Let's do a very quick review of inequality basics that you probably first learned about in second grade. We could replace x with 4 because 4 is less than 5. We could replace x with 2 because 2 is less than 5. We could even replace x with -3 because -3 is less than 5. We could go on forever, so as you can see there are many many solutions to this inequality! 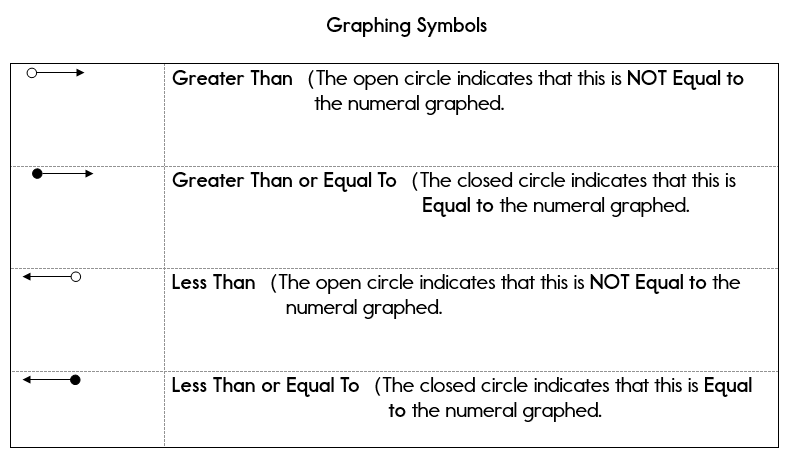 Let's take a look at the inequality symbols and their meanings again. When you graph inequalities that have only one variable, we use a number line. We will use open and closed circles and arrows pointing to the left or right to graph our answers. An open circle on the graph indicates less than (<) or greater than (>). A closed circle on the graph represents less than or equal to (<) or greater than or equal to (>). Take a look at the models below. x is greater than 5. I use an open circle on 5, since x is NOT equal to 5. Then I draw an arrow to the right to indicate that x can be any number greater than 5.
x is less than -3. I use an open circle on -3 since x is NOT equal to -3. Then I draw an arrow to the left to indicate that x can be any number less than -3.
x is greater than OR equal to -2. I use a closed circle on -2 since x is also equal to -2. Then draw an arrow to the right to indicate that x can be any number greater than -2.
x is less than OR equal to 10. I use a closed circle on 10 since x is also equal to 10. Then draw an arrow to the left to indicate that x can be any number less than 10. Whatever you do to one side of the inequality, you must do to the other side. Always get rid of the constant first and then any coefficients last. If you have fractions, get rid of the fractions first and then proceed with solving the inequality. Did you notice that you took the exact same steps that you would've taken in order to solve a regular equation? The only difference was that you had a less than sign instead of an equal sign. Now that was pretty easy! The next example is similar to example 1, but I would like to show you how to reverse your answer to make it easier to read and graph. Don't be afraid to do this if your variable ends up the right hand side of the inequality. Whenever you multiply or divide by a negative number, you must reverse the sign! I knew you were going to ask "Why?" And.... you should be asking why. It's important to understand these rules. Sometimes, the best explanations are through examples. Let's take a look. 3 < 5 3 is less than 5 is a true statement. **I know that I can keep my inequality balanced by multiplying or dividing every term by the same number, so.... let's multiply every term by -1. -3 < -5 Now we have -3 is less than -5. Is that a true statement? No, -3 is greater than -5, so in order to make it a true statement, we must reverse the sign. This works with any true statement as long as you multiply or divide by a negative number. Go ahead, try another one. Write a true statement, and then divide by -2. Ok... let's look at a few examples. 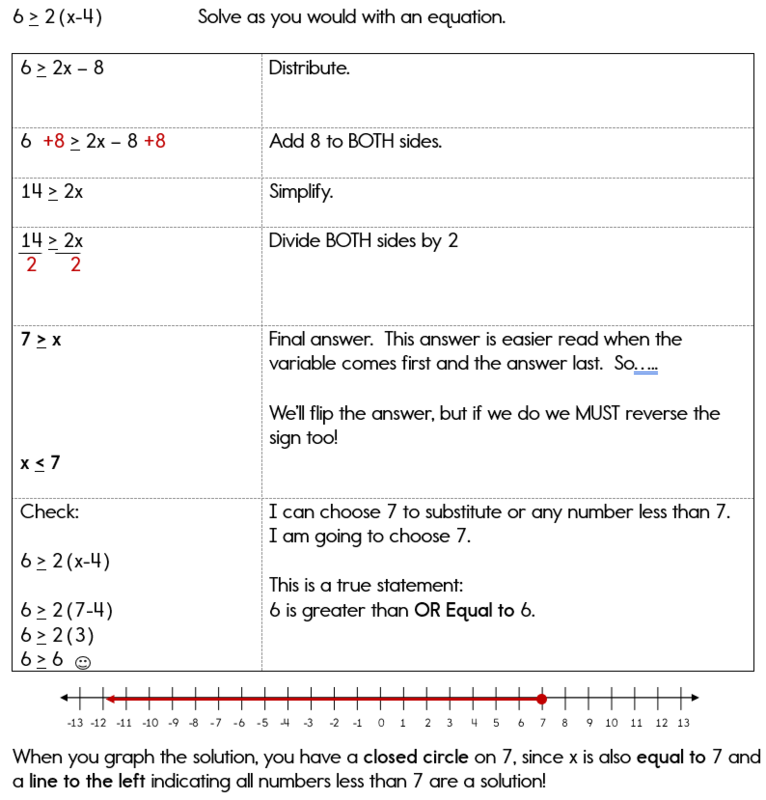 Our next example revisits how to solve equations and/or inequalities with variables on both sides. 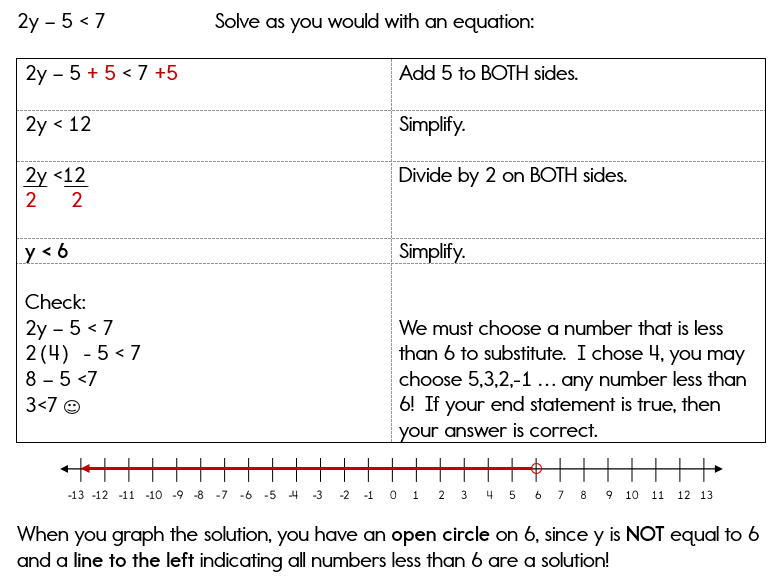 Let's take a look at how our new rule applies to solving equations. Pay special attention to the part where we divide by negative 1. 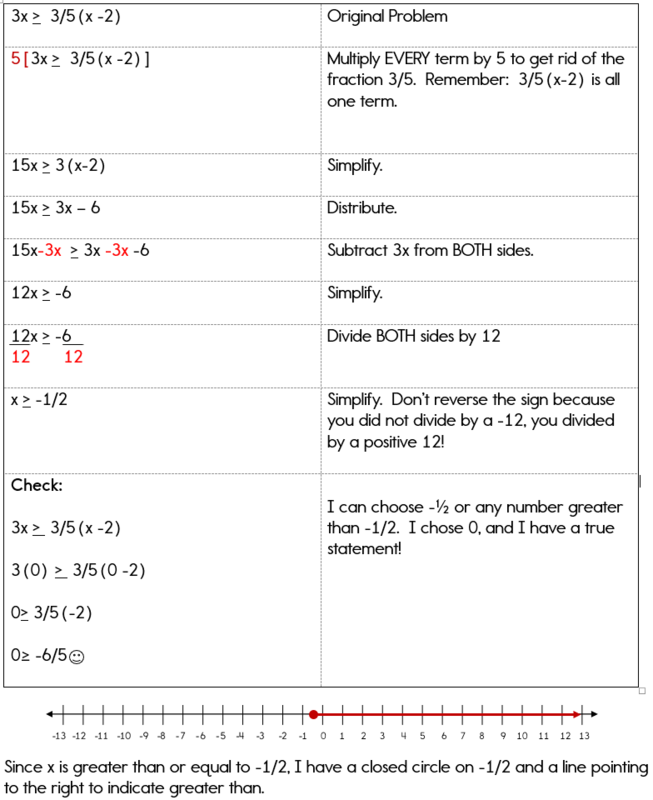 Our last example revisits how to solve equations and/or inequalities with fractions. I hope you remember the trick. Now are you ready for a few on your own? 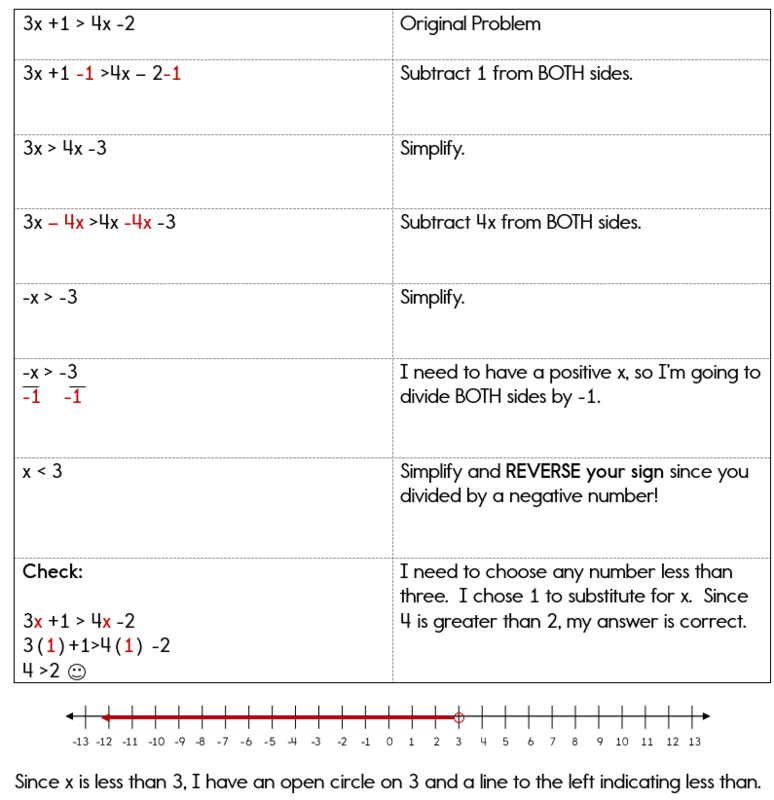 Click here to move onto Solving Inequalities Practice Problems. 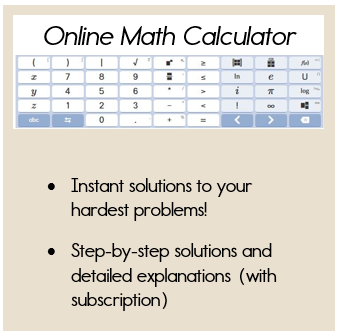 Try this calculator for step by step answers (with subscription).